This was quite a chase. 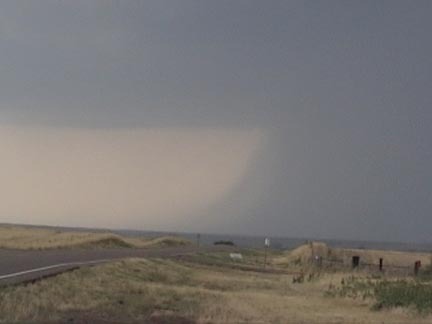 I saw one of the anticyclonic tornadoes that occurred northeast of Calumet, OK, and three other possible tornadoes, though all were either brief or rain-wrapped; cyclonic and anticyclonic rotating wall clouds; giant hail at least 4 inches in diameter; and multiple funnel clouds. Here is the detailed chronology, with pictures and relevant weather statements. Now that the Storm Data files based on the OKC NWS damage surveys of this storm are available, I have, as of September 4, 2004, made the final set of additions/updates to this report. Even so, I remain uncertain (although less so than earlier) about the exact nature of some of the funnels and rotating wall clouds that I saw, for reasons explained below. 7 a.m - Out the door from our vacation base in Santa Fe, NM. Preliminary target is Clinton, OK area. Stop at Allsups for coffee and breakfast burrito; once on the road I discover that I got a sausage, egg, cheese sandwich instead. 12:20 - Data, lunch, pit stop in Amarillo. Situation pretty much unchanged, high CAPE just east of dryline, jet max coming over TX panhandle and W. OK, good convergence, 986 MB low projected over W. KS at 0Z. High risk over central, N OK east of about Weatherford. RUC predicts small area of storms breaking out in west-central OK by 21Z; south of about I-40 cap increasingly becomes a limiting factor on storms, though they will be severe if they form even as far S. as north TX. Target still looks good, though I figure that if storms fire I could end up following them to near OKC. 2:00 - Cu have grown to TCU, I'm just west of Shamrock looking east. 2:20 - TCU to NE is now CB as I'm about to cross into OK. Other weak CB form SSWrd next few minutes. Around 3 - Data stop planned for Sayre becomes quick radar check. PDS tornado watch now in effect until 10 p.m. for central, western OK; also parts of KS, TX. Radar shows two storms, one NW of Sayre moving NE or even NNE; the other about to cross from TX into SW corner of OK. Both are strengthening, with weaker convection between. I decide to target the southern storm figuring it would be easier to intercept - plus the "tail end" storm is usually better due to less cooling of inflow from nearby storms. 3:30? I'm west of Willow. Southern storm appears to have weakened; radar summary from radio station confirms this. I head back N on 34 to intercept what I thought was the northern storm north of Elk City. In reality, however, what I ended up going after may be another storm that developed between the original two. I'm relieved to pick up NOAA WX radio signal near Elk City, and keep it for the rest of the chase, except in a few low spots. 4:00 I intercept storm, now SVR warned, after I turn W from 34 onto 33 at Hammon. About 6 miles west of there I see nice rainfoot as storm produces golfball hail NNE of Cheyenne at 4:20, then a small wall cloud, as the storm goes TOR warned. Other chasers, TV vans are also on the storm at this time. A Severe Weather Statement issued at 4:30 can be found here. As can be seen in the Storm Data, this storm produced numerous reports of up to golfball hail in the Cheyenne area between 4 and 4:20. Rotation (as detected by radar) ends; I follow storm N and E on 34 and 47, just after it produces 70 mph gust at intersection of 34 and 47, as described in this severe weather statement issued at 5:10. New TOR issued as I'm on 47 between 34 and 183. The storm looks better again; DOW also watching it. I stop again and soon see good rotation in a slightly lowered area to my N. Nice rainbow forms in east; around Burmah I hit heavy rain from next storm S being pulled into my storm by inflow. 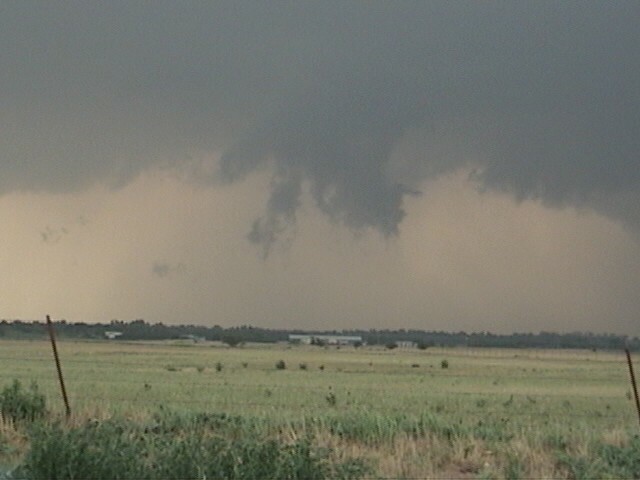 As a result of this, the meso becomes hidden, and I have seen the last of the rotation that I will see with this storm. I turn N on 183 to try to get out of the rain and approach meso again, but now the rain is so heavy I have to turn back west at Putnam. This was quite an experience: Blinding rain w/ 50 mph? wind from the south (blowing into the meso to my N), with the sun shining! Finally I break out and see the retreating meso to my NE about 1-2 miles W of Putnam. 4 miles N of Putnam, this storm produces 2.5-inch hail just after 5:30. Now, the other chasers in the area and I notice that the southern storm is now looking awesome! It has a straight, rock-hard tower with increasingly backshearing, knuckled anvil, as shown here. 2 other storms are now between the one to my northeast and the one to my south, so almost the entire area to the east between the two main storms is filled in. Again, rainbows form as the two dominant storms pull in the rain (which looks white fron the direct sunlight hitting it) from the two weaker storms. The northern storm is pulling rain to the north and southern storm to the south. This process can be seen in this picture. 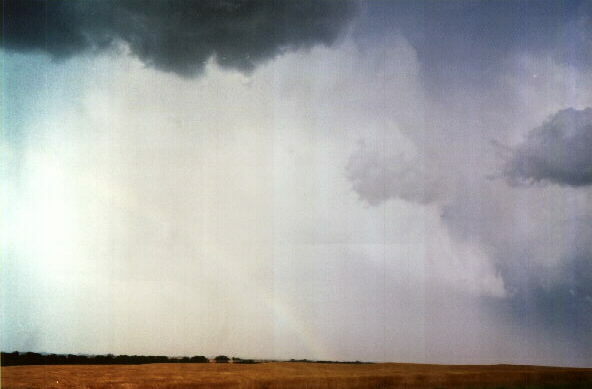 Although the picture is a little overexposed and did not scan well, you can see the rain at the lower right being drawn southward into the southern storm, as well as the rainbow on the horizon near the middle of the picture. I return to 183, go north toward northern storm for a while. It's looking OK, but moving into difficult road area (and also making my return to Santa Fe more difficult the farther N I go), while the southern storm looks better and better. 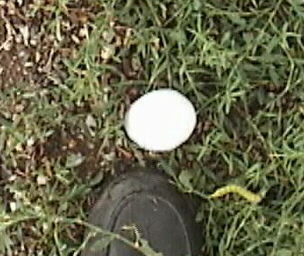 I decide to return S on 183 to try to catch southern storm. Heading S, lots of cloud motion in E, nice rainbow, flanking line of southern storm directly ahead of me. 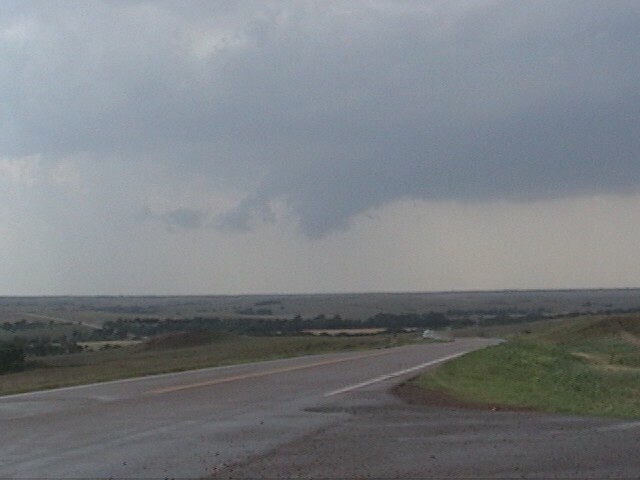 As I approach 47, I see a lowering form under the tilted updraft of storm to my SE. Minutes later, TOR is issued as a tornado is reported at what I heard to be 4 mi SW of Thomas (time?) However, the LSR and SWS made the location 10 miles SW of Thomas, which would have been closer to my location. My lowering was diffuse but somewhat funnel shaped and in the right place on the storm - but not more than halfway to ground, if that. Unfortunately, I did not get a picture of this feature. I did not think it looked developed enough to be a tornado, and I was more interested in catching up at this point than stopping for pictures. However, the feature quickly disappeared in the rain, and I did not see it again. Could this have been the start of the tornado reported 10 mi SW of Thomas? UPDATE - June 20, 2004. Based on comparison with reports from other chasers, I think what I saw may have been the start of the tornado, but it was NOT the tornado itself. The tornado was rain-wrapped by the time it was on the ground, and I did not see the feature described above after it disappeared in the rain. FINAL UPDATE - September 4, 2004. The tornado started 4.5 miles SW of Thomas and moved ESE, according to the damage survey. This would make it too far away for me to have seen, and as noted above the Storm Data indicates that the tornado was rain-wrapped. What I saw may have been the early stages of the circulation, but was not the actual tornado. I pursue the storm east to Thomas. West of Thomas, I see 4-inch hailstones, and stop with lots of chasers just west of Thomas to watch storm and photograph 2.5 inch hailstones. Talk with spotter who had windshield broken by hail. Lowering has quickly become hidden by rain. Major street flooding in Thomas. Regarding hail size, Storm Data lists 4.75 inch hail in Custer City and 4.25 inch hail 3 miles east of there. I turn S just E. of Thomas on 54, then East on E0950 Rd (route 58), which goes east, then south, then east, then south again ending up at Hydro. Perhaps 4 mi. S. of Thomas, I come to 2 emergency vehicles where tornado appears to have crossed road. 3 or 4 power poles are down (luckily on E. side of road, toward E so not across road) and branches are also down. This is between locations of reported touchdowns, so likely tornado was on ground for some distance. This is confirmed by the damage survey, which also indicates that the tornado did cross the road at this point, and dissipated shortly thereafter. From route 54, I think somewhere south of the location where the first tornado crossed the road, I heard a new tornado warning and noticed a diffuse lowering to my east. 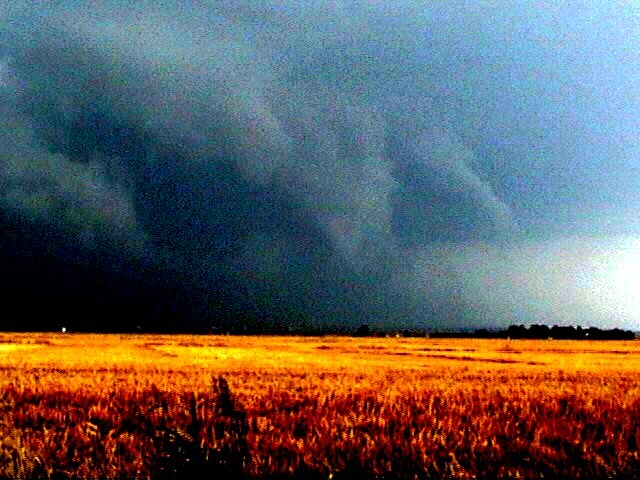 I enhanced a video capture from this location from looking east toward Geary to obtain this image. In comparison with other chasers pictures of the tornado or tornadoes that occurred from 9 mi. WNW of Geary east into the Geary area and beyond, I thought that this lowering may have been associated with that tornadic activity, but due to the poor contrast I was not sure. This was likely taken looking east from route 54, before I turned east on route 58. The Storm Data indicates this tornado, which was rated F2 and was on the ground for nearly an hour, began a little over 10 miles east of the location where I likely obtained this video capture, and was rain-wrapped for much of its life. Given this information, I think it is unlikely that the lowering in this picture was the Geary tornado, although it could have been the very earliest stage of it. More likely, the tornado was wrapped in the rain behind the lowering. In the second place where the route 58 goes east, I see a couple chasers looking NNE, and looking there I see a ropy funnel at least halfway to ground, probably more, at 7:30 p.m. Because it was at least (probably more than) halfway down, I'd say it was more likely than not a tornado, though not a sure thing. Being under the flanking line, it would probably be a landspout. It ends in less than a minute, before I can stop and turn on video camera. Likely location: just west of American Horse Lake, somewhere near the center of the triangle formed by Thomas, Hydro, and Greenfield. This is not listed as a tornado in Storm Data, but I continue to believe based on its appearance that it could have been. There were very few who saw it - most chasers were watching the main meso farther east, which at this time was producing an F2 tornado. And this feature was very brief - less than a minute. So I guess I will never know for sure whether it was a tornado or just a funnel cloud. I start up again, only to see two short narrow funnels form simultaneously around 7:33. These did not extend as far down as the earlier one. Again I stop; again they dissipate before I can video. This picture was taken shortly after the second two funnels disappeared. Main meso is now over Geary, as described in this severe weather statemnent. (It reportedly caused a rain-wrapped tornado about 6 miles west of there at 7:25; in fact the Storm Data confirm that this was part of the long-track rainwrapped tornado that began 9 miles WNW of Geary and tracked all the way to 11 miles west of Okarche.) Here is a radar image of the storm around this time. 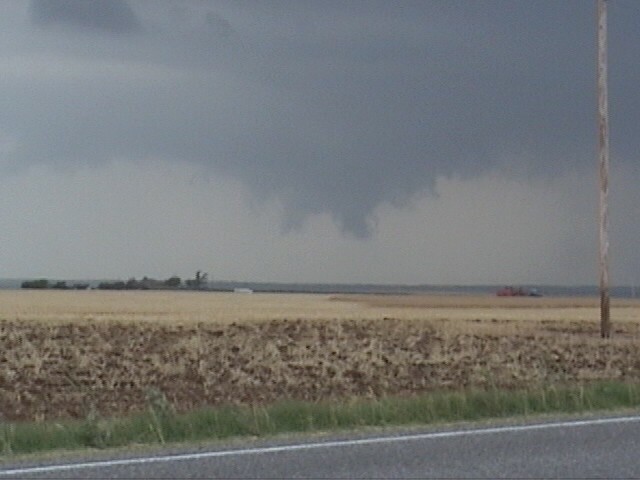 I briefly see a distant lowering; no idea whether or not it was associated with the Geary tornado. But storm is getting away from me. To catch up to the storm, I have to go to I-40 and blast east to 66 and 270 to re-intercept near Calumet, because the road network east of my location is interrupted by the Canadian River. The storm produces multiple tornadoes N of Calumet just before I can get to it. I pass DOW again, scanning east into the darkness. Now I'm getting play-by-play on radio from Gary England, Val Castor, and others on TV chase teams. I see (and they report) anti-cyclonic rotation just NE of Calumet. The anti-cyclonic wall cloud was nicely backlit and was rotating strongly; the rotation of the cloud tags looks very good on video. 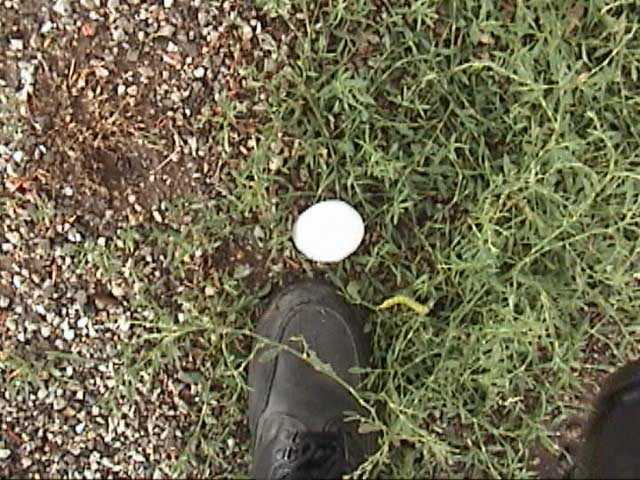 It briefly produced a needle funnel that extended more than halfway to the ground. I heard after my chase that some chasers reported a dust swirl under this feature; which would make it a brief anti-cyclonic tornado, although I could not confirm this from my location. However, as described below, the Storm Data report confirms that this was the second of two anticyclonic tornadoes that occurred northeast of Calumet. 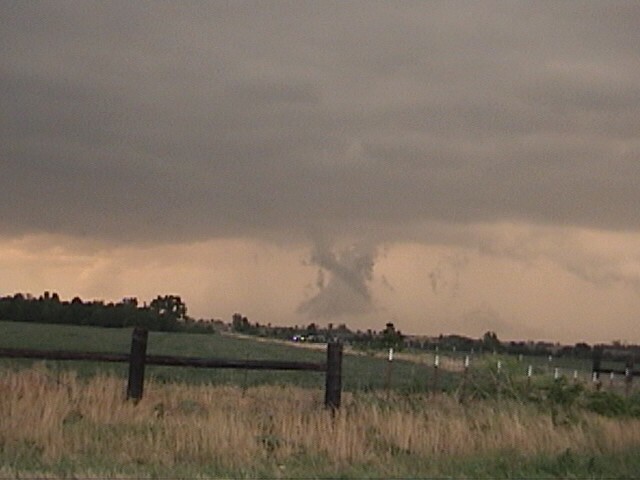 UPDATE - June 20, 2004 - I am still not sure whether or not anyone observed a dust swirl under the anti-cyclonic wall cloud and needle funnel that I saw. It does seem to be the case that the most persistent of the earlier tornadoes I missed north of Calumet was anti-cyclonic, and that the anti-cyclonic rotation I saw was a different one from the one that produced the earlier tornadoes. FINAL UPDATE - September 4, 2003 - As noted above, Storm Data confirms that this is the second of two anticyclonic tornadoes that occurred northeast of Calumet. 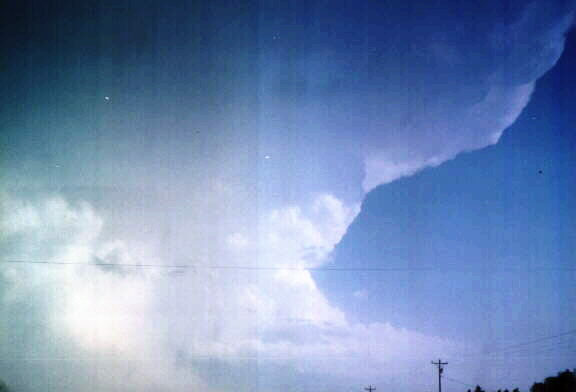 The first, which had a condensation funnel all the way to the ground, was documented by a number of chasers. The second, which I have highlighted in red on the Storm Data listing, formed to the northwest of the first one. Although both were rated F1, the second one was shorter in duration and track. The time, location, and description all roughly match what I saw. Although it did not produce condensation to the ground, it did cause damage and my video of the intense anticyclonic rotation of the cloud tags associated with this tornado is some of the most interesting I have shot. 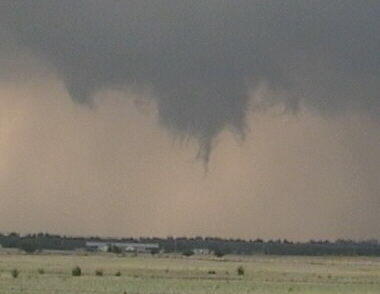 TV crews also report tornadoes without any condensation or lowerings NE of Calumet and near or just NE of Concho. Storm data confirms a third tornado, possibly anticyclonic also, 2 miles NW of Concho. I did not see this one. I did, however, watch numerous lowerings, including what looked like a large wall cloud to the NE, from 3 mi ENE of Calumet. There are also interesting-looking lowerings along the flanking line, such as this one (viewed from Calumet) and this one (viewed from 3 ENE of Calumet), though most of these lowerings under the flanking line are just scud. Initially, I couldn't confirm any tornadoes from my location 3 ENE of Calumet, although TV teams reported power flashes just NE of Concho and east toward Piedmont. However, on review of my video, I do have a distant power flash around 8:40 looking ENE toward the main part of the storm, and furthermore the video reveals a low-contrast lowering in the same area just before the power flashes. This may have been the rain-wrapped (from my vantage point) tornado, probably somewhere around route 3 W or NW of Piedmont around 8:40. Here is a DV capture of this feature as it appeared to the eye; the lowering of interest is just behind the cab of the pickup truck. 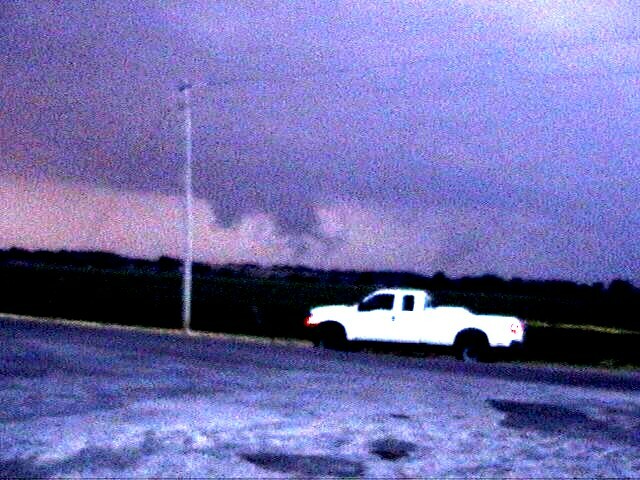 Here is an enhanced version of the same picture, which shows the funnel-shaped lowering better; the power flash occurred just to the left of the location of the lowering in this picture less than a minute later. TV stations also photographed a tornado and reported power flashes in this area shortly before 9, so I am pretty sure I have a rain-wrapped tornado here. At 8:45 I call off the chase, b/c it's getting dark, storms are about to enter OKC metro area, and I'm nearly out of gas. 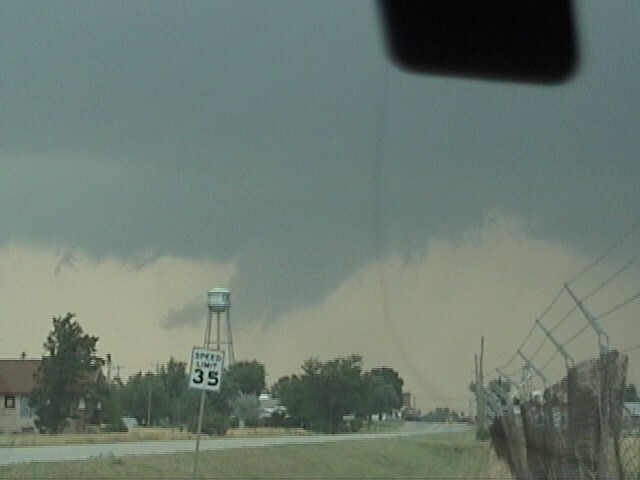 UPDATE, SEPTEMBER 4, 2004 - After reviewing the last part of my video, going frame-by-frame, I am not sure whether the lowering shown above is attached to the cloud above or is scud (it does appear detached a minute or so after this capture), but just before the power flash (which occurred about 2 minutes after this video capture) there is a flash of lightning which does illuminate a funnel-shaped lowering most of the way down, which does appear to be attached, in about the same spot. However, the power flash is in fact to the left (NW) of the lowering (which also shows up in the frame with the power flash), suggesting that it may have been associatd with RFD wind, or maybe even with powrline damage related to a lightning strike, since the lightning flash is within 2 seconds or so of the power flash. In fact, the Storm Data report indicates that most of the damage in this area was caused by straight-line wind, so that is the likely cause of the power flash. 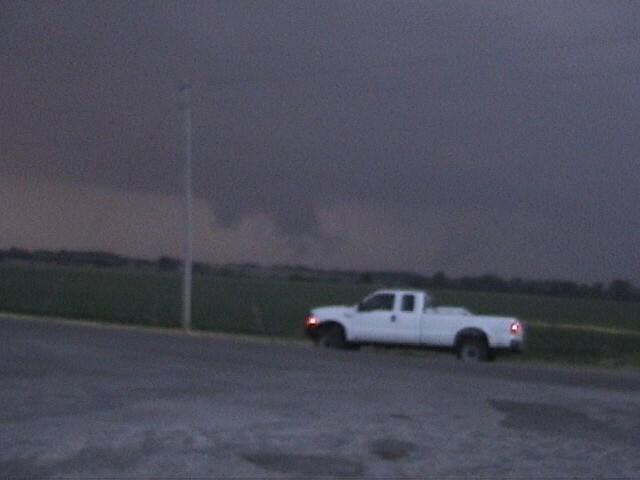 On the other hand, I do have a lowering in the general area, about 9 or 10 miles to my ENE, where the tornado occurred. The upshot is that I may well have gotten either the tornado west of Piedmont or a funnel cloud as the tornado was developing (this may have been a few minutes before the reported time of the tornado). However, I am not sure enough of this to say so with certainty. I gas up in Calumet, buying gas from young woman who says she'd rather be chasing, and start the long trip back toward Santa Fe, listening to Gary and his team report the storm's progress through the NW parts of the OKC metro. Day's total: 1 anticyclonic tornado, 3 other possible tornadoes, at least 3 funnel clouds and probably more, cyclonic and anticyclonic rotating wall clouds, 4-inch hail, floods. Had I stayed with the southern storm all the way, I might have done even better, as once I switched back to it I was too far behind it to see most of the rain-wrapped tornadoes or even some that weren't. Still, an amazing day. As a bonus, I also caught a couple nice dust devils while driving to Oklahoma and two more the next day on the way back - 3 of these in New Mexico and one in Texas. Total chase distance: About 1200 miles (estimated).